To make sure that any area of space cannot be occupied by more than one object, then we need collision detection based on the geometry arrays of the objects. The big issue with collision detection is the number of tests that have to be made and therefore the CPU resources used. During an animation we may need to check for collisions at every frame therefore it is important that collision detection is very efficient. We therefore need to consider the following issues. The amount of processing to detect collisions will depend on the number of objects, the number of possible collisions will depend on the permutations between any two moving objects, this will be roughly proportional to the square of the number of moving objects. One way to cut down the number of tests is to partition the space, for example regular cubes, voxel grids, octtrees, k-d trees, BSP trees, we then only have to test objects within a given space (or possibly adjacent spaces) for collision. This assumes that the objects are not too large compared with the space size, we may need to make special arrangements for very large objects, like the ground. This allows us to scale up the number of moving objects in our simulation and keep the amount of processing time closer to a linear relationship than to the square of the number of moving objects. In the scene here, each of the shapes is surrounded by a red rectangular boundary. If any of the boundaries overlap then the shapes may, or may not, overlap and further tests are required, if the boundaries do not overlap then the shapes have not collided. So this allows us to eliminate some of the CPU intensive tests for overlap of complex shapes. It is very easy to test boxes for overlap, provided they are all oriented in the same direction, we just need to compare their minimum and maximum x,y and z coordinates. For instance if box 'A' is defined by AxMin, AxMax, AyMin, AyMax, AzMin, and AzMax. and box 'B' is defined by BxMin, BxMax, ByMin, ByMax, BzMin, and BzMax. The diagrams on the right show the conditions in the x dimension. For the boxes to be overlapping in 3 dimensions then they must also be overlapping in the y and z dimensions. use an algorithm to detect the intersection of arbitrary oriented boxes, in absolute coordinates, which would be much more complex. or recalculate the boundary box at every frame in axis aligned absolute coordinates and doing things at every frame is a big overhead. If a single box around the object does not give accurate enough collision detection for the shape then it is possible to use multiple boxes such as octtrees. Again the octree needs to be axis aligned in absolute coordinates for efficient implementation. The advantage of this method is that it is independent of orientation (provided that it is rotated about the centre of the bounding sphere) So this does not have the problem mentioned in bounding boxes where the axes need to be aligned. The disadvantage with bounding spheres is that it may not fit a long thin object very well, in that case there will be some false detection of collisions, but in that case we can use a secondary check to test the boundary more carefully. 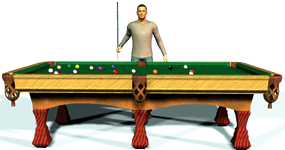 If there are a lot of objects then looking for collisions between every object and every other object must be a heavy overhead to do every frame. Only consider pairs of shapes whose bounds overlap. Only consider shapes that are moving toward each other. It may not be good enough to rely on the bounding rectangle or sphere alone especially if the objects are complex shapes. Although the bounding rectangle can at least filter out those objects that don't overlap. Another reason that we cant rely on bounding rectangle or sphere alone is that in order to go on to the next stage of working out the collision response we also need to know the point of impact relative to the centres of mass. 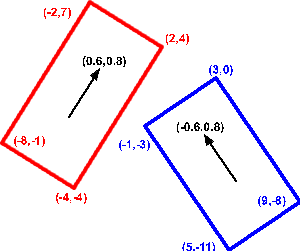 We can increase the accuracy of the bounding rectangle method if, instead of just using one rectangle, we use multiple rectangles to more accurately match the shape of an irregular object. If we want to test for collision of meshes, made up from triangles, and we want to check for collisions accurately, using all the information from the geometry, we may need to test each triangle. Once we have culled any non contenders for collisions using the methods above we may then have to test each triangle on object 'A' with each triangle on object 'B' for intersection. If both the triangles lie on the same part of the line then the triangles intersect. Many of the algorithms for detecting collision between two shapes require the shapes to be convex, that is, these algorithms can't cope with holes or dents in the shapes. If we want to use these algorithms with non-convex shapes we must first decompose the shapes into a larger number of convex shapes. Although this convex decomposition, into the minimum number of convex shapes, is a hard computationally intense problem although it only has to be done once for a given set of shapes: not every frame. Collision detection based on the geometry arrays of the objects is only available in Java3D version 1.2 onward. Action may be delayed after collision actually happens. Collision may not be detected if objects pass through each other between frames. Once a collision is detected, then we have to to work out new velocities, etc. (see collisions) As you can see this is very difficult if both objects have 6 degrees of freedom. Therefore we may be forced to use numerical instead of analytical methods, however if the objects are constrained in any way, for example if they were hinged or constrained from rotating, or there is any other constraints on the motion then it may be practical to use analytical methods. To see a proposed structure for collision detection in a scenegraph see here. This page just gives an overview of ideas of collision detection. For the mathematics of how to calculate collision response of solid bodies see this page. On this page we discuss how calculate how to calculate the effect of collisions on solid bodies. Modeling collisions involves a lot of assumptions and approximations, also the concept of an 'impulse' is not always intuitively obvious. We also need to understand how to work with objects that have both rotation and linear motion. Instead of expressing the dynamics equations in terms of differential equations we can use integral equations, this can help to simplify many types of problem. In classical mechanics the Newtonian equations of motion are equivalent to minimizing the action over the set of all paths. In Quantum Mechanics (QM) all paths have a probability but paths with a lower action have a higher probability. The action of a particle (point element of matter) is determined by the Lagrangian L(x,v) which is a function of its position and its velocity. If we have two planes then they define a vector (assuming the planes are different from each other). That is along the line where the planes intersect. 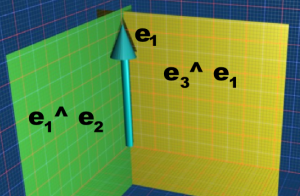 This page explains how this is related to the inner and outer products of Geometric Algebra. Collision Detection in Interactive 3D Environments by Gino van den Bergen.